Bernhard Henrik Crusell, clarinetist and composer, was born on October 15, 1775 in Nystad, Finland and died on July 28, 1838 in Stockholm, Sweden. Although he did compose for other instruments and won the Swedish Academy’s Gold Medal in 1837 for his Swedish translations of French, German and Italian operas, he is probably most remembered for his works for the clarinet, most of which were written between 1803 and 1812: 3 Concertos for Clarinet and Orchestra (Op. 1 in Eb Major, Op. 5 in F Minor and Op. 11 in Bb Major), a Symphonie Concertante (Op. 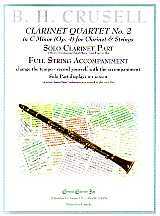 3, for clarinet, horn and bassoon), 3 Duets (Op. 6, for two clarinets), Introduction and Variations (Op. 12, for clarinet and orchestra) and 3 Quartets (for clarinet, violin, viola and cello, Op. 2 in Eb Major, Op. 4 in C Minor and Op. 7 in D Major). The Opus numbers represent the order in which the works were published, rather than the order of composition; Concertos No. 1, 2 and 3 were not necessarily written in that order. Most of the major works for the clarinet were written for clarinetist who were friends of the composers: W. A. Mozart (1756-1791) wrote his Trio, K. 498 (for clarinet, viola & piano), Quintet, K. 581 (for clarinet & strings) and Concerto, K. 622, for clarinetist Anton Stadler (1753-1812); Ludwig Spohr (1784-1859) wrote 4 Concertos and various other solos for clarinetist Johann Hermstedt (1778-1846); Carl Maria von Weber (1786-1826) wrote his Concertino, Op. 26, Variations, Op. 33 (for clarinet & piano), Quintet, Op. 34 (for clarinet & strings) and 2 Concertos, Op. 73 & 74 for clarinetist Heinrich Baermann (1784-1847); and Johannes Brahms (1833-1897) wrote his Trio, Op. 114 (for clarinet, cello & piano), Quintet, Op. 115 (for clarinet & strings) and Two Sonatas, Op. 120 (for clarinet & piano) for clarinetist Richard Mühlfeld (1856-1907). Of these clarinetists, only Heinrich Baermann also composed for the clarinet. Crusell’s Chamber music is interesting, in that, he, quite correctly, treated all of the instruments relatively equally. Many works for clarinet and strings, Weber’s Clarinet Quintet (Op. 34) for example, focus almost exclusively on the clarinet, relegating the strings to merely accompaniment; however, most of Crusell’s Chamber works for clarinet and strings have interesting and challenging parts for not only the clarinet but also the strings too, especially Clarinet Quartet No. 3. Crusell played an 11-keyed clarinet made by the Berlin instrument maker Heinrich Grenser (1764-1813) - a fact worth remembering when performing his works on a modern Boehm system clarinet with 17 keys and 6 rings. - Complete (All four movements) .